In 1974, the German manufacturer of mountain sports equipment was founded by Albrecht von Dewitz. Interestingly, the company's name, VAUDE (pronounced [fau`de:]), is derived from von Dewitz's initials: "von Dewitz" became "vD", which in turn became "Vau" "De". At an early stage in the Southern German company's development, VAUDE began manufacturing high-quality clothing for cyclists as well, in addition to the array of professional clothing and rucksacks they had already been producing for mountaineers. As early as the mid-1990s, VAUDE assumed a pioneering role in terms of its efforts to make environmental and social improvements in all areas of the company. For example, the company established the Ecology recycling network in which they began developing recyclable products for athletes. Since 2001, most VAUDE products have been in line with the stringent bluesign standard, which tests and assesses the entire textile manufacturing chain. This means that bluesign not only determines specific guidelines in order to prevent the incorporation of environmentally harmful substances into the production process, but it also monitors and guarantees a company's compliance with environmentally-friendly production. In 2009, the founder's daughter, Antje von Dewitz, took over the company, which remains a completely family-run business. In 2010, VAUDE became a member of the Fair Wear Foundation and began collaborating with WWF Germany. VAUDE really stresses corporate responsibility and thinks big as well: their goal is to become "Europe's most environmentally-friendly outdoor label" and still be profitable in the process. In addition to their production facility near Lake Constance, VAUDE has their own site in Asia, which allows them to monitor and uphold the high ecological and social standards there as well. As ambitious as it may seem, VAUDE has set out to make the world a better place. "The a-text--green theme" is a comprehensive sustainability strategy that applies to all areas of the company: everything from product design to selecting the materials to manufacturing and logistics is monitored. Every little detail is assessed in terms of sustainability, environmentally friendliness and social acceptability. Even if certain areas are way above the industry average, VAUDE will stop at nothing to make them even better. Sustainability is VAUDE's most fundamental strategy. Their headquarters in Southern Germany are both climate neutral and EMAS certified. In addition, VAUDE not only has their very own cafeteria, which provides the employees with delicious organic foods, but they also opened a company daycare centre in an effort to promote a healthy balance between work and family life. VAUDE's desire to increase employee satisfaction and find the perfect balance between work and family life is also evident in the sports classes they offer and their e-bike and carpooling initiative. 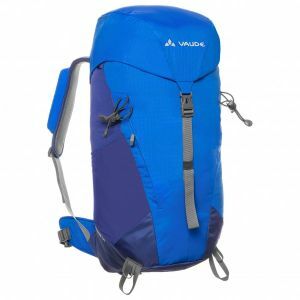 As for their products, VAUDE strives to create a durable and timeless design. In other words, their products should look as good as possible so that they will be used for as long as possible. Of course, their products should also be easy to repair and recycle as well. VAUDE's quality seal: "Green Shape"
Since there are no uniform "certificates" for the evaluation of environmentally-friendly outdoor products to go by, the people at VAUDE took it upon themselves to create their very own Green Shape evaluation system. Green Shape is primarily based on the criteria of the bluesign system, but it has been expanded to cover other materials and standards alongside bluesign. In order for a product to be Green Shape certified, it must meet high ecological standards. This means that product design, the material, manufacturing, care and recycling are all part of the evaluation. When it comes to the fabrics, VAUDE puts a lot of time and effort into ensuring that no environmentally harmful materials are used. 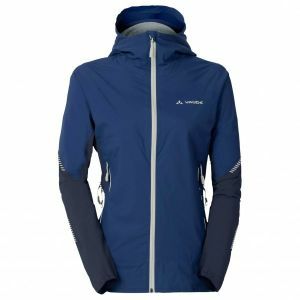 Their use of bluesign- or OEKO-TEX Standard 100 certified materials means that VAUDE refrains from using PTFE membranes, PVC and genetic engineering. For the customer, this complicated procedure results in a simple Green Shape label, which guarantees an eco-friendly product that does no harm to people or the environment. VAUDE always focusses on sustainability and potential environmental impact. Yet, the Swabian mountain sports expert has never lost sight of another important goal: to manufacture functional and functioning outdoor clothing for every area of use and every generation. Vaude's designers not only have to stand up to stringent ecological guidelines but also have to consider the expert opinions of Vaude-sponsored athletes and incorporate these ideas and suggestions into production. Regardless of the sport- be it alpinism, mountaineering, climbing, skiing or cycling - VAUDE sponsors exceptional athletes in any and all product-relevant areas. Plus, they also host an array of events and workshops, which allow them to keep in touch with their partners and customers in a personal way. This also not only gives customers the opportunity to gain direct insight into VAUDE's products and philosophy, but it also provides VAUDE with the opportunity to tend to the needs and wishes of their customers and incorporate them into the design of future products.